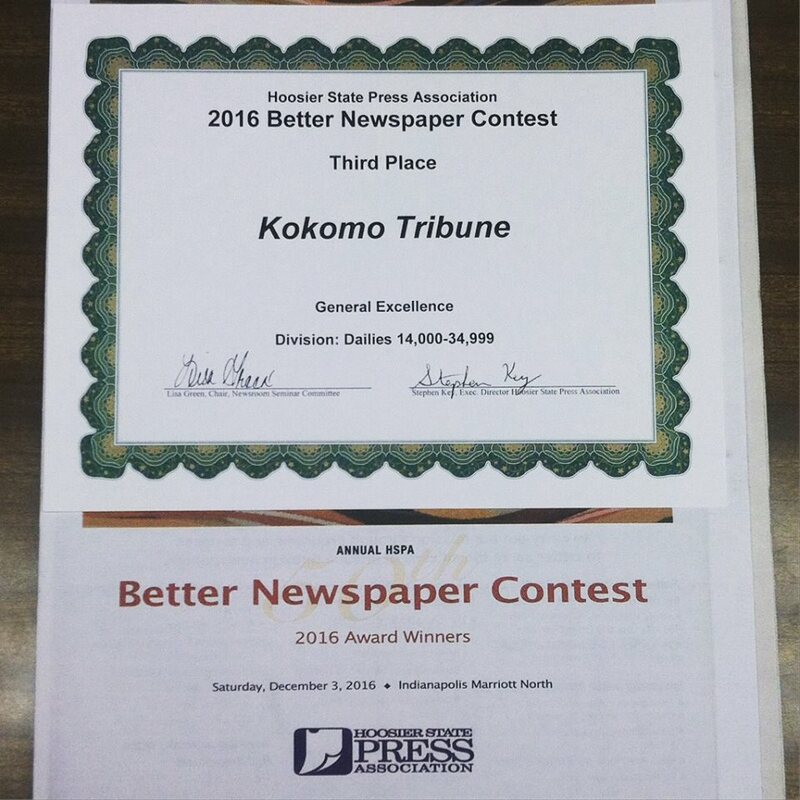 On Dec. 3, 2015 at the 2016 Hoosier State Press Association Foundation Better Newspaper Contest Awards Luncheon and Newsroom Seminar at the Indianapolis Marriott North, Kokomo Tribune won Third Place for General Excellence for Division 5, which comprises daily newspapers with circulations between 14,000 and 34,999. 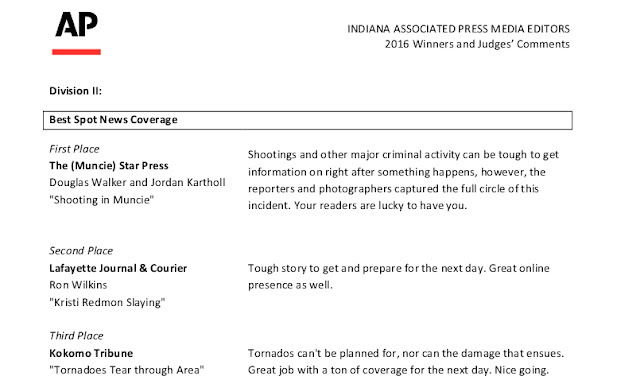 INDIANAPOLIS - The Kokomo Tribune brought home 16 awards at this year’s Hoosier State Press Association Foundation Better Newspaper Contest. 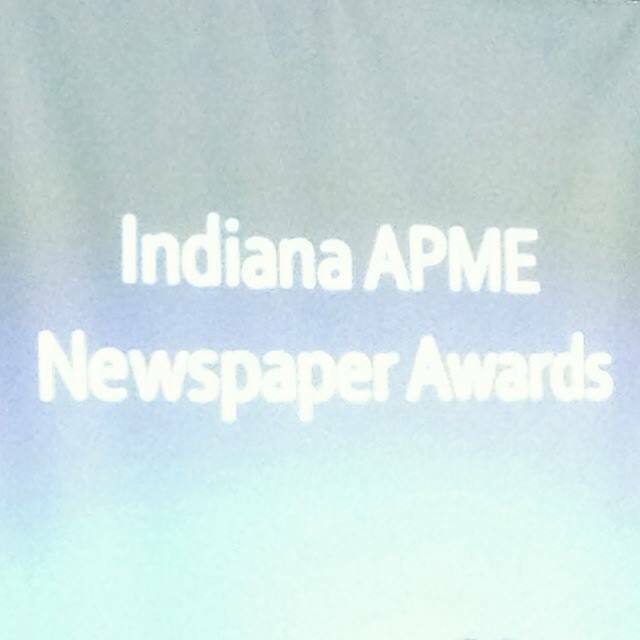 The results were announced at the 50th annual awards luncheon Saturday at the Indianapolis Marriott North. 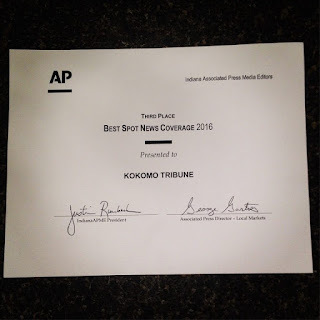 Work submitted to the contest was published between July 1, 2015 and June 30, 2016. 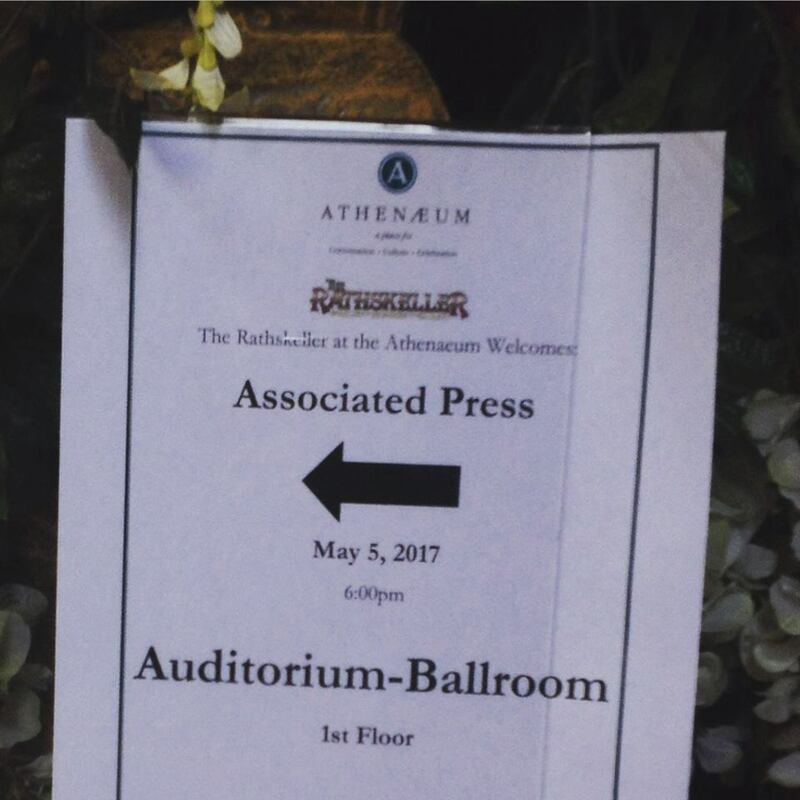 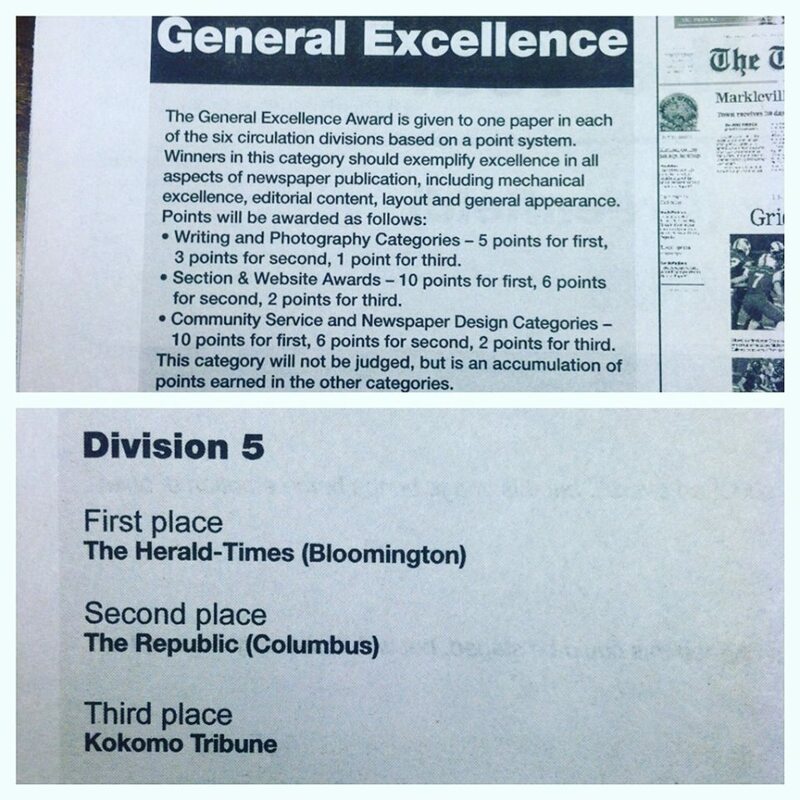 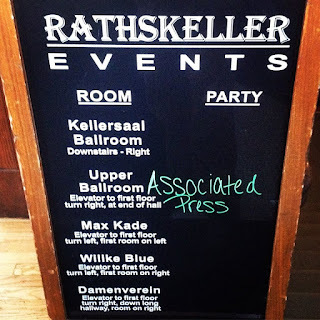 The Tribune received a third place nod for General Excellence. 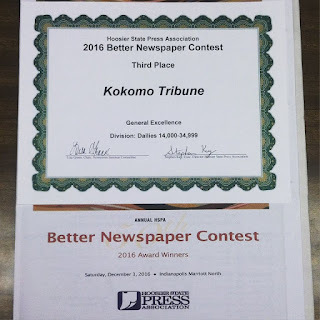 Several individual Tribune staffers were also honored for their work. 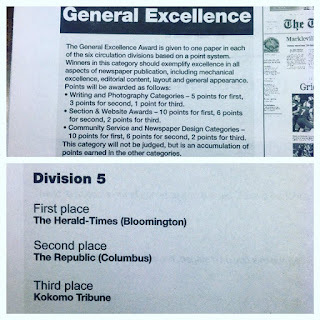 “This entry took an issue that doesn’t have a clear-cut answer, as both sides point out their reasons, and shows the readers why when it comes to education (which affects everyone) there will always be debate,” wrote the judges. “Great look at an issue and showing the readers the difficulties law enforcement and government face when it comes to jails,” wrote the judges. 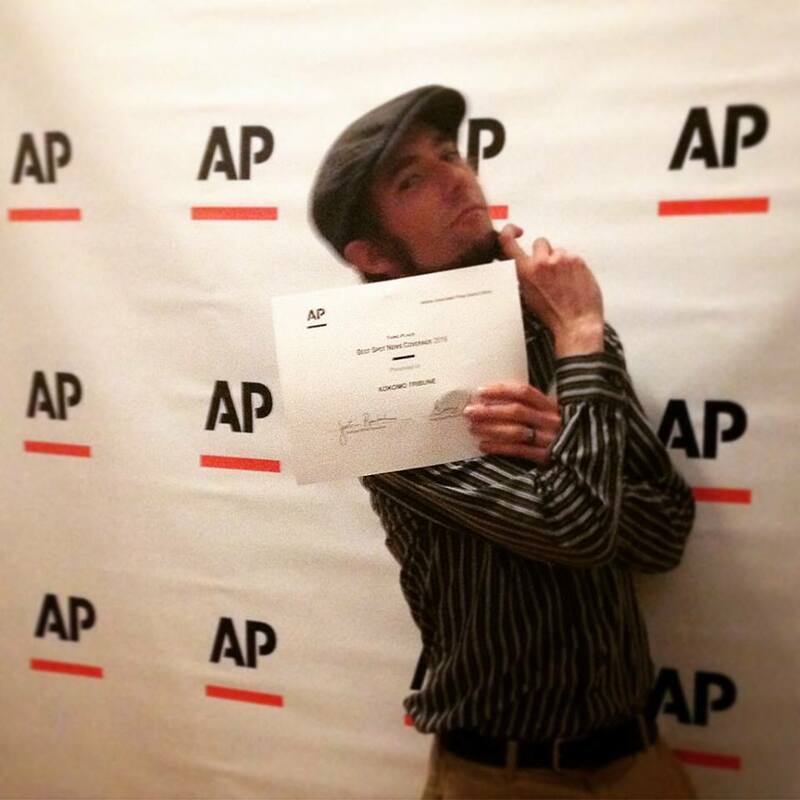 “The writing is compelling and nearly flawless,” wrote the judges. 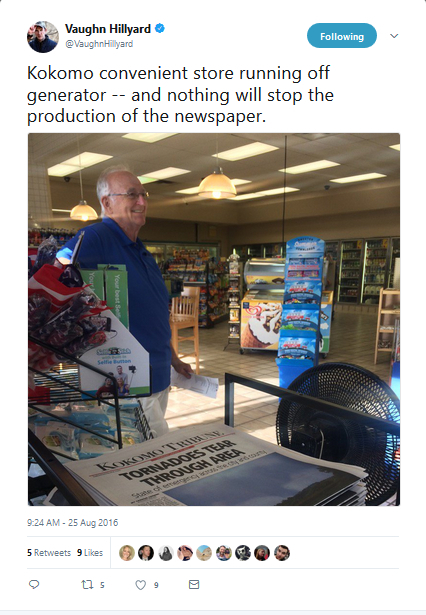 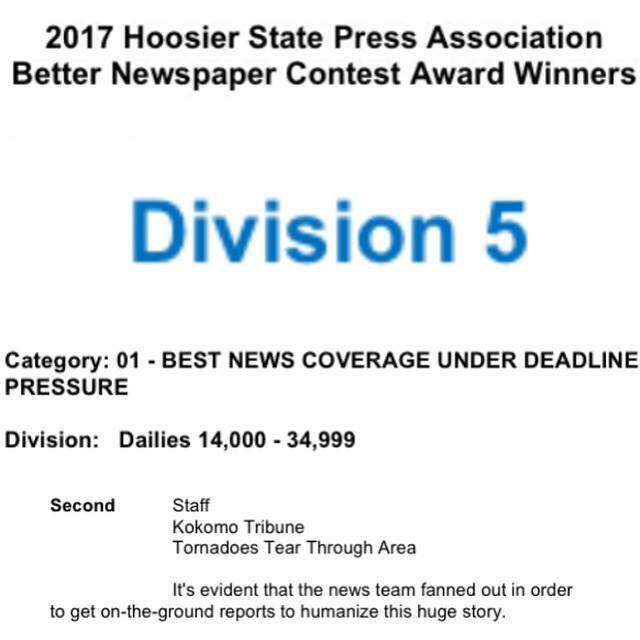 This entry was also a finalist for Story of the Year. 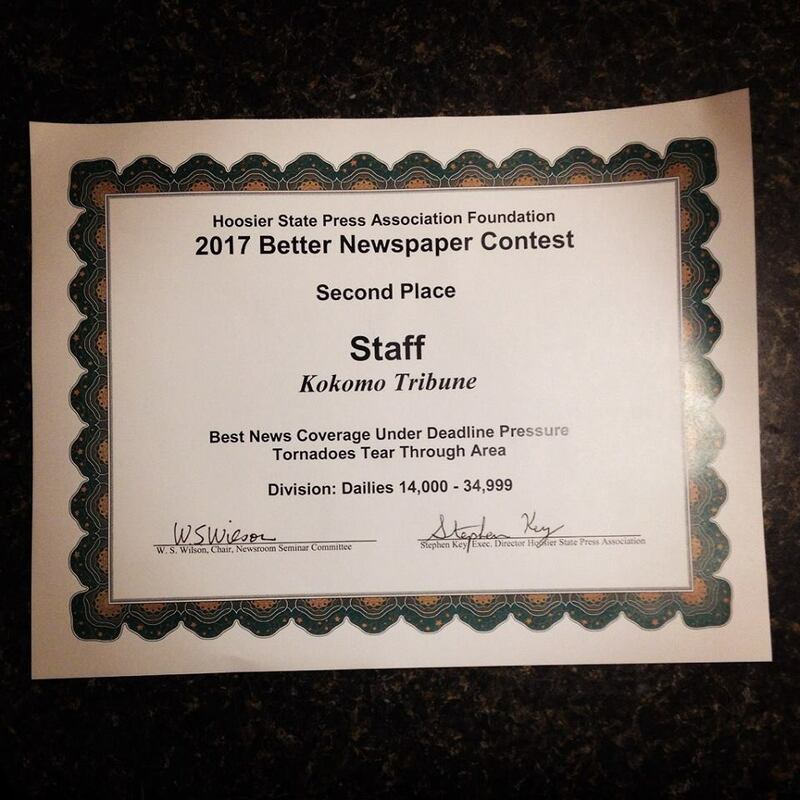 Tim Bath won both first and third places in the Best Spot News Photo category for his photos “House fire” and “Night fire,” respectively. “Such a haunting, spectacular photo,” wrote the judges of the winning entry. 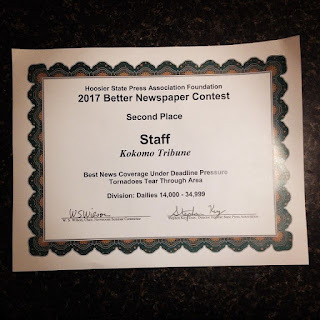 Kelly Lafferty Gerber took home third place and Bath first place in the Best General News Photo category for their photos, “Cops 4 Kidz” and “Propane training,” respectively. Rodney Ogle won second place in the Best Use of Graphics category. 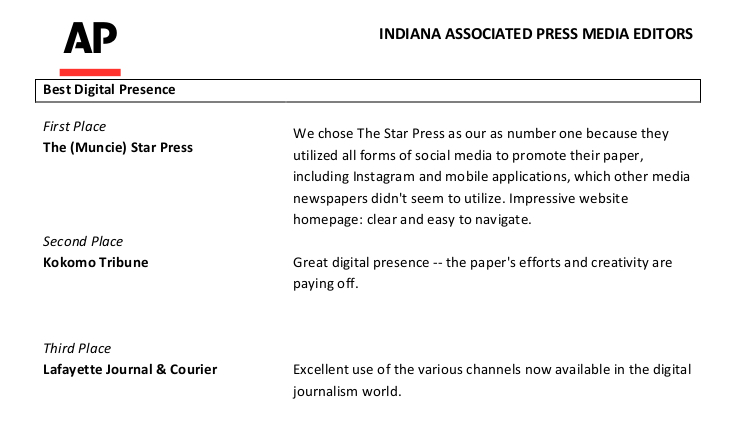 “Great way to think outside the box,” wrote the judges. 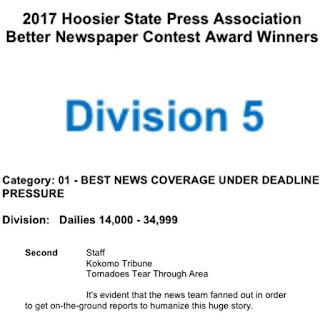 On Dec. 3, 2016 at the 2016 Hoosier State Press Association Foundation Better Newspaper Contest Awards Luncheon and Newsroom Seminar at the Indianapolis Marriott North, Kokomo Tribune's staff won Second Place for Best Ongoing News Coverage for Division 5, which comprises daily newspapers with circulations between 14,000 and 34,999. 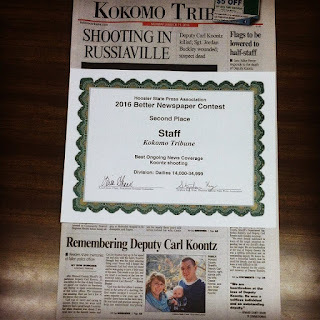 My contribution to this entry was my March 21, 2016 story, "Remembering Deputy Carl Koontz." 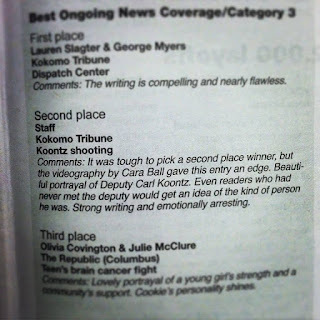 "It was tough to pick a second place winner, but the videography by Cara Ball gave this entry an edge. 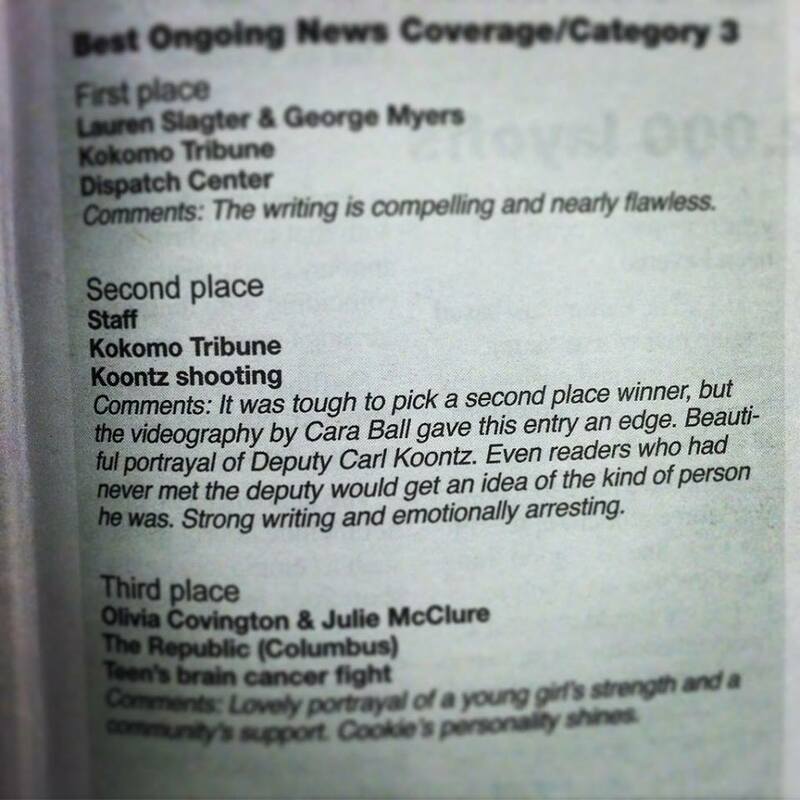 Beautiful portrayal of Deputy Carl Koontz. 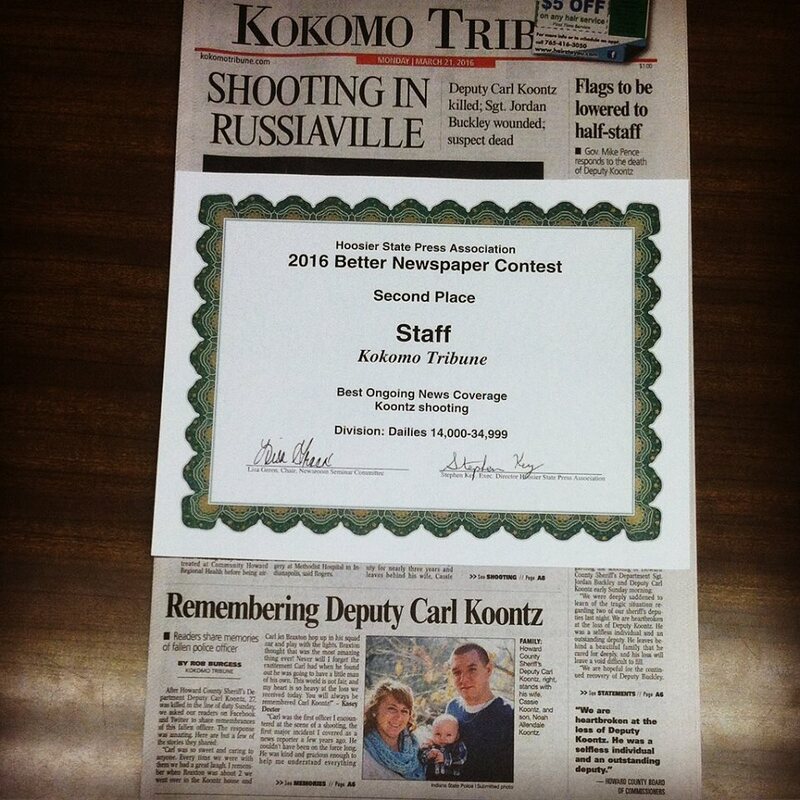 Even readers who had never met the deputy would get an idea of the kind of person he was. 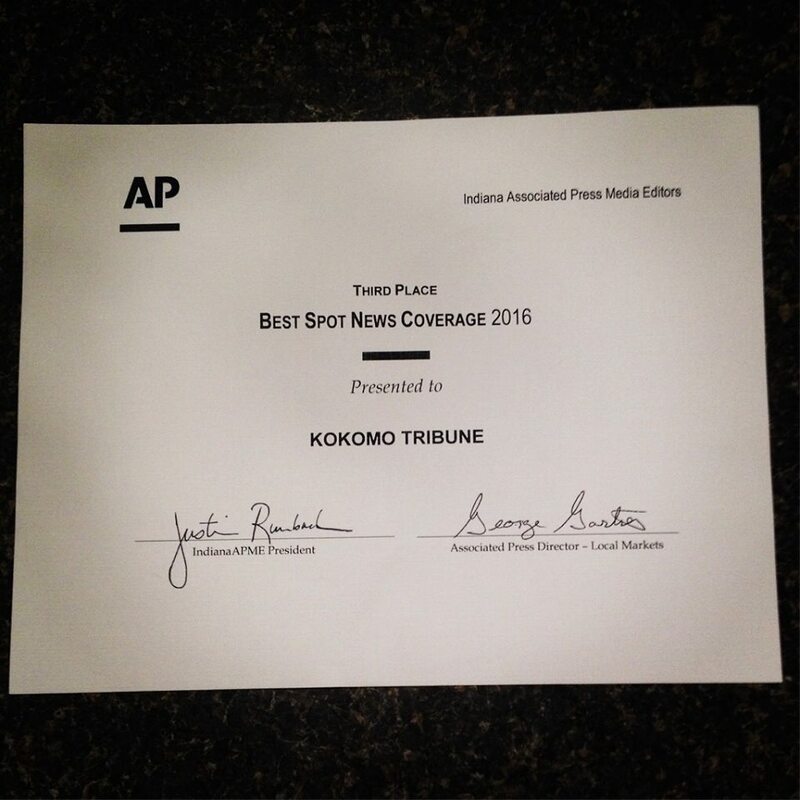 Strong writing and emotionally arresting."